- the trunk port is configured to transmit untagged frames on Vlan1 and tagged frames on Vlan2. - the IP address and the netmask (/24) are assigned to the interface. - the link light is become green. - from interface management, the link is detected (Dark gray : SX SFP, Status: Active, Utilization: 0%). In the hyperterminal session, I'm able to sucessfully ping and connect to all devices behind switch A. In the hyperterminal session, I'm able to sucessfully ping and connect to all devices behind switch B.
switch A can't ping switch B and switch B can't ping switch A. Is the optical fiber broken ? As the switches have more than one VLAN, it needs to know the next hop to deliver traffic requests. In this case the next hop is the core switch (I suppose that is the SFP switch). 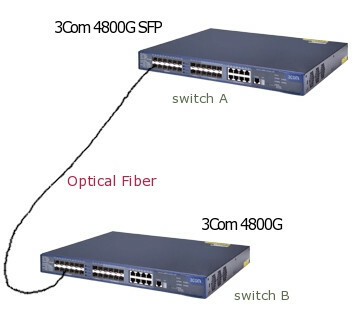 As your network grows, with more switches included in the environment, each one of these new switches needs to have a default route also, always indicating that the next hop is the core switch.